The Smith & Wesson Galaxy 13 Flashlight is an excellent choice if you’re looking for a torch that’s particularly easy to handle. It has two LED bulb colors: white for regular illumination and red to help preserve your night vision and avoid disturbing anyone else with a bright white light at night. 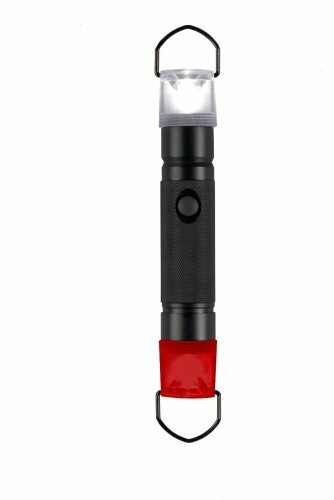 The flashlight has a limited lifetime warranty and uses three AAA batteries which are included in the purchase. The Smith & Wesson Galaxy 13 LED Flashlight is currently selling cheaper than the listed price. 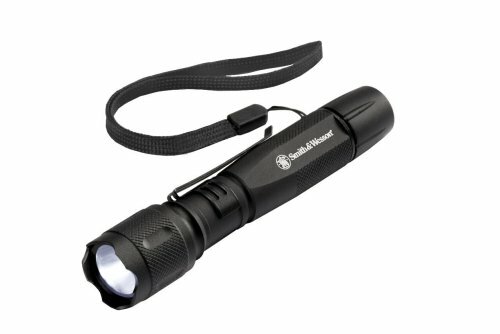 It is popular not just because of its brand name but because the performance has been consistent with a few tweaks in the design that makes it a great all-around flashlight – people who travel at night like pilots and truck drivers find a red light LED torch a very useful part of their tool kit. The Smith & Wesson brand name alone is enough to convince many that this Galaxy 13 is a good buy. S&W is an American brand that has been selling since 1852 and its flashlights are designed and produced exclusively by Powertech Inc in Tennessee. This is the same company that made Coleman safety products from 2004 to 2005. The Galaxy 13 comes with 10 white and 3 red LED bulbs. The red is for use at night so one does not get bothered and blinded by the glare of white light. The lumens for the white LED is 10 and for the red LED is 6.5. The white LED bulbs will work for 30 hours with 3 triple A batteries while the red LEDs are good for 80 hours. The batteries are included in the purchase of the flashlight. The beam is different for the white LEDs at 17.1 meters and 16.5 meters for the red LEDs. The focus of the beam is permanent and cannot be adjusted. Structurally, the flashlight is has an anodized aluminum case packed with a soft holster case with a belt hoop. The case even has a pocket for an extra set of spare batteries. It is not waterproof but looks like it can take a few seconds of water immersion in case you drop it accidentally. At one end of the flashlight are 2 tiny holes where you can attach a lanyard. The casing also has a textured grip making it easy to hold. To operate the flashlight, you will need to push the buttons on the body. The forward button will turn on the white LEDs while back button switches on the red LEDs. You can play around with the switch to get the flicker light but there is no permanent switch for this type of mode. The flashlight also has a security mode that stops it from switching on accidentally. 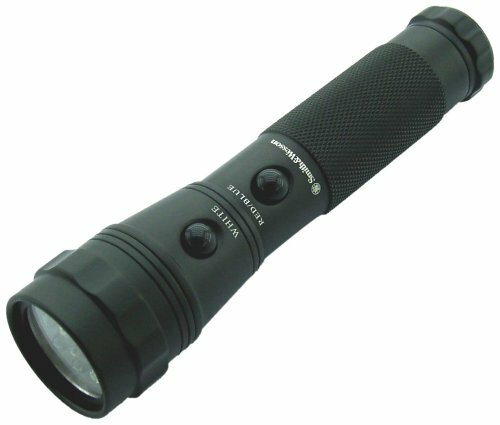 To give you an idea of the quality of this flashlight, this is the choice for the US military for many years because of the red light LEDs. It helps them with map reading, signaling, and emergencies at night. Any problems with the LED lights and switches can be forwarded through email to the manufacturer. These are under lifetime warranty and the usual case is that the flashlight will be replaced. While the intensity of the white LED light is not as bright as other flashlights and the beam is also limited, this S&W Galaxy 13 Flashlight has a lot of supporters and loyal followers. It has been getting excellent ratings and earned 4.4/5 stars in Amazon. It all started in the year 1852 when Horace Smith and Daniel B. Wesson teamed up in Connecticut, targeting the market of their initial product, a lever action repeating pistol. This pistol, which used a self-contained cartridge, did not get much luck. By 1954, the company ran into financial issues. Because of this, the two had no choice but to sell the company to Oliver Winchester, a shirt manufacturer. Using Smith & Wesson’s original design, hundreds of pistols were sold and then Winchester founded Winchester Repeating Arms Co.
Smith and Wesson tried their luck again in 1854, designing a small revolver with the Rimfire cartridge. This became a hit and the first patented self-contained cartridge in the world. Then and hereafter, the accomplishments of Smith & Wesson cannot be beat. Their innovations since 1852 are highly recognized up to this day. Created with the law enforcement, military, hunting, sporting enthusiasts, and safety-concerned citizens in mind, the Smith & Wesson Tactical Flashlights line have now improved and expanded since the day they were first launched in the market. There are even flashlights for casual and everyday use. The thing with this product line is that each of them has kept abreast with the changing needs of consumers to date. They also offer the newest technology, giving users around the world a high end experience for the most important use of all – safety and survival. As of this writing, these are the Smith & Wesson Tactical Flashlights that are taking the market. An all-purpose flashlight with the brightest and most compact design, the Galaxy Flashlight makes an alternative for people who want to stay on track even on the dimmest situations. Since it is compact, it can be easily carried and stored in all sorts of places or containers. Regardless if you are placing it in a bag, briefcase, backpack, or car, you’ll barely know it’s there since it is super light and little. The durable body is made of black anodized aluminum material. Since it is equipped with LED bulbs, durability and long-lasting illumination is guaranteed. 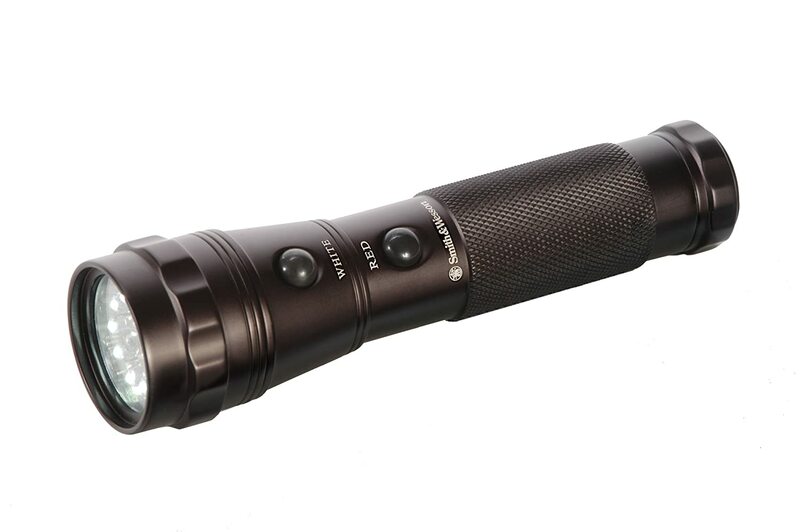 The flashlight is 4 inches in length and powered by 3 AAA batteries. Right now, it is sold with limited lifetime warranty. Greater performance and even better features – these are the main things to love about the M&P3 LED Tactical Flashlight. While beam settings is set to high by default, you can always flick the switch easily to switch to low beam and to save on battery power. The flashlight’s body is made of Anodized Aerospace Aluminum, while bulbs operate on CREE LEDs. Designed to last a lifetime, Smith & Wesson M&P3 is acclaimed for being a performing flashlight. When set to high beam, the M&P3 emits 275 lumens. When low, on the other hand, it drops at 56. It’s also impact resistant and waterproof for up to 1 meter submersion. It is certified by ANSI FL1 and comes with 2 Energizer lithium batteries, a pocket clip, a holster, and a lanyard in the package. Geared with colorful LED bulbs, this Smith & Wesson Flashlight makes a great companion at nighttime, whether at home or outdoors. The LED bulbs consist of 6 bright white, 2 red, and 2 blue, 2 green colors, providing a fun way to illuminate your way home. Blue and green are designed for low light viewing. Regardless of the light you prefer, you can easily activate them as each set of color is connected to a separate switch. And since it utilizes LED, there’s no need for bulb replacements. 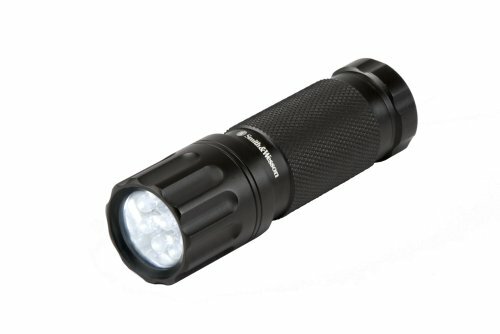 To give you excellent grip, the flashlight is crafted with knurled handle. It runs on three AAA batteries, which are included in the package. Equipped with 100-lumen brightness, this handy Smith & Wesson flashlight is getting massive positive reviews for being light, compact, and durable. Thanks to the inclusion of CREE LED, which never needs replacement because it’s built to last. The body is designed with a tactical tail cap, so you can mount it easily when desired. Galaxy Elite is powered by 2 AA batteries. If you’re looking for a reliable yet versatile flashlight, then the 4 in 1 lantern is your best option. Outdoor trips, power outages, or emergencies, you can rely on this compact and functional illumination device at all times. At one end, it features a clear filter. On the other, it boasts a red one in order to help you preserve night vision. Other items that come in the box are carabiner clip and magnet. Rest assured that by getting one, you’re getting a flashlight that’s convenient, portable, and easy to access no matter what. It’s also durable, shatter proof, and scratch resistant. You’ve had the top tactical flashlights by Smith & Wesson. Leading the weapon and gear market for years, you’ll know for sure that if it’s Smith & Wesson, it’s built to last.